Insurance Research Group/John K. DiMugno, Attorney-at-Law in Cameron Park, CA offers legal advice to insurance companies. 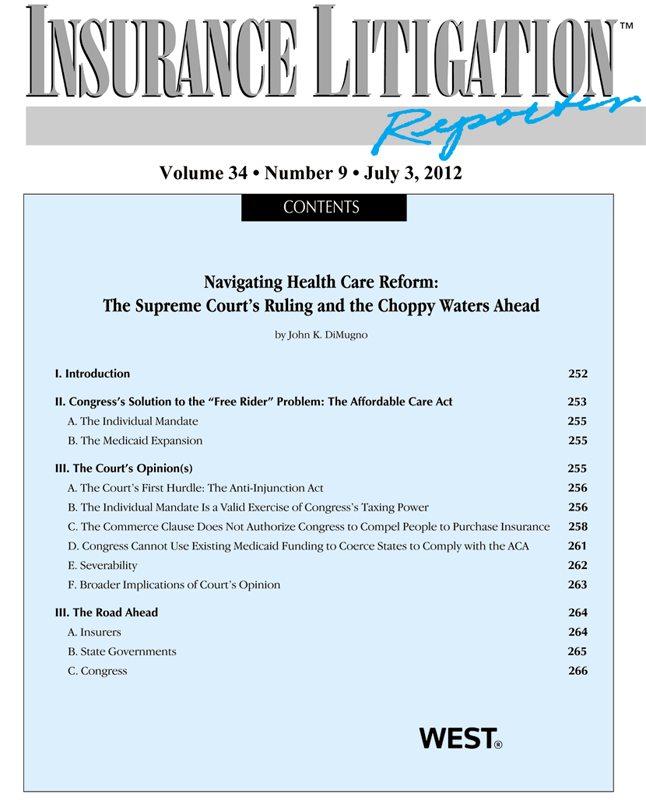 Mr. DiMugno has written, edited and published his flagship publication, Insurance Litigation Reporter, for more than 30 years. Now published by Thomson Reuters West, Insurance Litigation Reporter has been cited as authority by state and federal courts and singled out by the Wall Street Journal in an article on insurance coverage litigation. For information on Mr. DiMugno’s other books and periodicals, see Books & Periodicals. John K. DiMugno, Esq. is an advisor, consultant, mediator, and expert witness on insurance coverage, bad faith, and claims handling issues on the behalf of insurance companies and policyholders worldwide. John K. DiMugno has specialized in insurance coverage and bad faith law as a member of the California bar for more than 30 years. He has served as an advisor, consulting attorney, amicus curaie and expert witness on a wide variety of insurance coverage and bad faith issues for both policyholders and insurance companies across the United States and in several foreign jurisdictions. His experience encompasses every type of insurance---personal lines, commercial lines, commercial general liability, D&O, professional liability, umbrella excess liability, health and disability, and property insurance. He has been called upon to review insurance policies, recommend coverage determinations, and render advice concerning the handling of insurance claims in compliance with the applicable legal standards as well as the customs, practices and standards of the insurance industry. Mr. DiMugno is a member of the Adjunct Faculty of Boalt Hall School of Law, University of California, Berkeley, where he has taught insurance law. He also is a frequent speaker at continuing legal education seminars across the country. Mr. DiMugno is the author of numerous books and articles on insurance law topics and the editor-in-chief of three Thomson Reuters periodicals covering insurance and tort law topics. In addition, Mr. DiMugno regularly contributes commentary on nationally significant insurance law developments to the Thomson Reuters Legal Solutions Blog. Copyright © Insurance Research Group/John K. DiMugno, Attorney-at-Law, 2015. All rights reserved.